Sophomore point guard Teddy Okereafor will transfer from Virginia Commonwealth University to Rider next season. VCU’s Teddy Okereafor will transfer to Rider, per a source. Two years of eligibility remaining. Good PG for the MAAC. 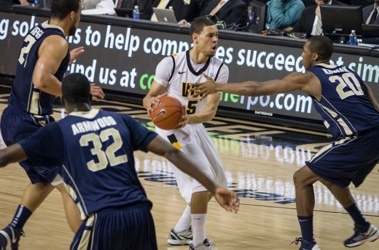 A London, England native, Okereafor made his way to VCU through Christchurch School. He was the Rams’ top ranked recruit in the 2011 class, but his minutes and role have been limited during his first two seasons. His departure opens up even more minutes for junior point guard Briante Weber and freshmen Douglas Brooks, JeQuan Lewis, and Jairus Lyles. The past year has been wild for the Rams’ personnel. On April 5th, 2012 Reco McCarter announced he would transfer to Campbell. In July, VCU added 2012 SG Melvin Johnson in what Coach Smart called his fastest recruitment ever. On October 5th, 2012 freshmen Jordan Burgess and Mo Alie-Cox were ruled partial qualifiers. VCU added walk-on Torey Burston mid-season and he first dressed for a game when VCU travelled to University of Richmond. The day before the Atlantic 10 Tournament, DJ Haley left the basketball program. To stay up to date on all things VCU Basketball related, follow @rvaRAMnews on Twitter or Facebook and sign up for our email newsletter. Aaron Williams loves music, basketball (follow @rvaramnews! ), family, learning, and barbecue sauce.